For those of you who've been glued to the tv set for the past few weeks and need a break from all the soccer in Brazil, here are two fun and refreshing slots to have a play on. Both of these slots available at Virtual City Casino feature that all important combination of low starting bets and high jackpots, so have a spin today and you might just make some extra cash for the week ahead! Robbie the Robot Butler is at your gambling service in this colourful and humourous 5 reel, 20 pay-line slot. During the Robot Butler Bonus Feature, you choose an item for Robbie to find and it can award you up to a massive 100x the triggering bet! Robot Butler also offers some great Free Spin treats, which pop up when three of the futuristic Butler's trays appear across the reels. 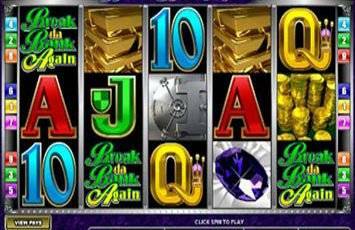 These herald the arrival of 12 re-retriggering Free Spins with a mystery multiplier as high as 5x. Click on any tray to reveal the Multiplier, which stays with you into any re-triggers. Play Robot Butler this week, and the Top 5 Wagerers each day will receive $100 into their Virtual City Casino Rewards Account. You may be wondering why Virtual City Casino is recommending that you play this 3 reel game, especially considering there's a more exciting newer version on offer (Break da Bank Again). The answer may become more obvious if you look at its recent history in the Winners tables – Break da Bank is paying out like crazy! Earlier this month, one lucky player won an incredible $218,000 playing the game, including two colossal wins of $68,000! So hop on board today to see if you can make those jackpot bells ring too. Try your hand at Break da Bank this weekend and 10 Lucky Players will be chosen to receive $100 per day.